The culinary industry has never run out of breath. The culinary industry, often hunted by the community because it is part of basic needs. In addition, the variety of cuisines is also the main attraction for the audience, both domestic and foreign cuisine. One of the foods that are on the rise is Turkish kebabs, typically Middle Eastern. Hendy Setiono is bringing Turkish kebabs to be introduced in Indonesia through his culinary efforts labeled Kebab Turki Baba Rafi. This young entrepreneur born in Surabaya, March 30, 1983, was indeed young to start a business in the food sector. 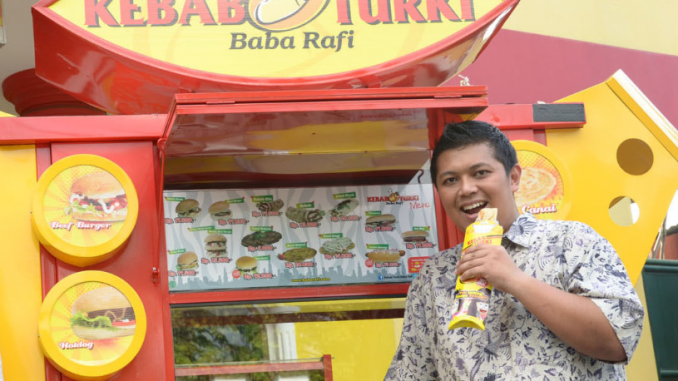 But in fact, he is now successful as President Director of Baba Rafi Enterprise, which covers a number of culinary-culinary products, including Kebab Turki Baba Rafi, Piramizza, and also does not miss the Mas Mono Grilled Chicken. Early in his business kebab inspired from his trip to Qatar, namely when he was on vacation visiting both his parents who work and live in the country. That’s when he saw opportunities for kebabs that have not been found in Indonesia. In September 2003, he started selling. His kebab selling cart operates at Nginden Semolo, not far from the campus and his house. With a capital of IDR 4 million which is a loan from his younger sister, he sells kebabs with an employee. Want to be fuller in running a business, he must stop studying in the fourth semester. In fact, his parents disagreed if his eldest son left college to do business and considered the project to be just a fad. But, he managed to prove his tenacity with the Success of Kebab Turki Baba Rafi has received many awards both at home and abroad. In 2015 there were more than 1,200 outlets spread throughout Indonesia, including 23 outlets in Malaysia and seven outlets in the Philippines. Not to forget also in Europe, their first outlet was opened in the Netherlands, Germany, Belgium, and England.